...and since I began casting bronzes of my own work, I've wanted to learn the process from the inside out. I notice a subtle but tangible quality in works that were created by artists who understand the process and/or execute it with their own hands. It allows me be present for the artistic decisions that can be made along the way, and opens my mind to the possibilities of the medium. In short, it creates a shorter path between imagination and tangible object. For the past year or so, I've been studying foundry work and casting some of my works at The Crucible, an industrial arts school in Oakland, just a few BART stops from my studio door. 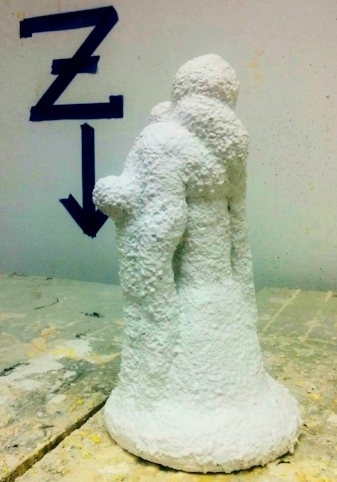 This six-inch figure will take us through the basic steps of casting a bronze. I modeled it directly in microcrystalline wax (which is the most commonly used at foundries). We'll be using the Lost Wax Method of casting in bronze: essentially the same process that has been used to cast bronze for approximately 6000 years, though technology has streamlined it. This will be a direct casting, meaning that the original wax will be used to create the bronze, and will be destroyed in the process. (as opposed to making a mold of the piece so that multiple waxes could be made and cast into bronze)... but in this case, she'll be unique. "Gates" are channels that allow the bronze to flow into the form of the figure, and air to flow out. The gates (seen in red here) are bars of wax that are attached to the figure using heat to melt the two surfaces as they contact each other. The number of gates and position varies depending on the unique form of the piece, so it takes some experience and practice ( sometimes humility) to become proficient at gating. Oh yes... it also takes imagination. One must imagine how the molten bronze will flow into the piece, and what obstacles it will encounter... and try to overcome them proactively. All of the positive shapes you see in the wax will become negative shapes, or empty spaces, in the later stages of the process. The plan is for the bronze to be poured into the funnel-shaped cup at the top. It will then flow downward through the large central gate or "sprue", as it's often referred to. The thinner red gates are called "vents". They will channel air upward, out of the figure, and facilitate the flow of bronze into all areas of the figure. The gated wax must be weighed to determine how much bronze to use in the pour. We'll use 10 pounds of bronze per 1 pound of wax. This time the gated wax weighed about 1 pound, so the math was easy. The gated wax is dipped into a liquid binder ("slurry"), and then coated with silica granules. The first layer, seen here, is with very fine granules which capture the details and textures of the piece. Successive layers will use more coarse granules to strengthen the mold. 10 layers are applied; and each layer must be allowed to dry for at least 2 hours before the next is applied. It generally takes a few days to a week to apply all of the layers for me (depending on my schedule that week). Here's how the completed shell looks. It's yellow when applied (right). To the far right, the shell has been "de-waxed". It was fired in a kiln at 1250 degrees. This process removes the wax, creating space for the bronze. It also fuses the granules of silica, strengthening and completing the shell. The yellow pigment disappears in the firing process. ...With the shell turned on it's side, you can see the opening where the bronze will be poured into the shell (left). Bronze ingots are heated in the furnace (behind me) to around 2000 degrees (F). There's time for a photo shoot while waiting for the bronze to fuse. ....(below, left), the bronze is still liquid. It cools rapidly (below, right), and a few minutes later is in a solid form again. As it cools it shrinks slightly, causing the shell to begin cracking. This begins the work of the next step, which is breaking the piece out of the shell. Once the shell is completely removed, there's always metal work to do. Here's the Little Laughing Lady in the grinding room, just after a good sandblasting to clean the metal. As you can see, the gates are still present and will need to be cut off with an angle grinder. Then the areas where gates are removed will need refinishing. Bronze is actually quite a forgiving surface to shape and work on: repairs can be invisible if done well. In this case, the metal work is quite simple as it's only a matter of removing extra material. Most often when casting larger, and/or more complex pieces, parts must be welded. To the right, the Little Laughing Lady is shown with her separated gates and cup. The majority of the metal used in the pour doesn't end up in the piece. The metal from the gates will be re-used (and can be re-used an infinite number of times). Very little is wasted. The piece is now ready for patina, and to be mounted on a base...so I guess the casting is complete. I went with a very light cold patina of liver sulfate, just to darken the recesses. I wanted to show off the natural color of the beautiful bronze. The surface is protected with paste wax to keep it from darkening too quickly.